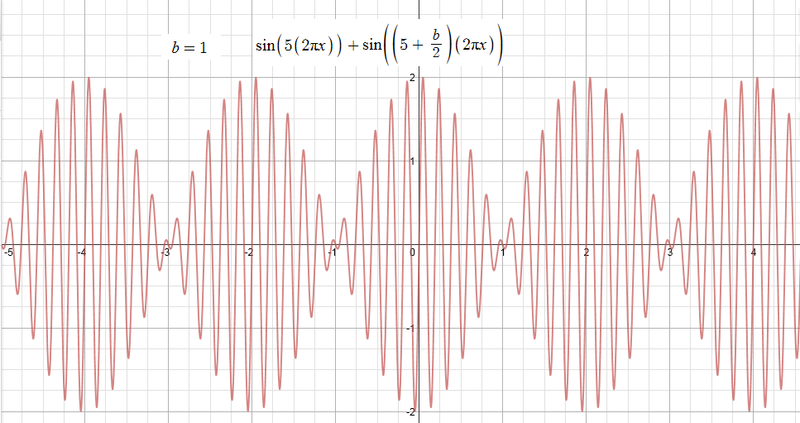 MUSIC: tuning,harmonic, equal temper, beat frequency :MATH – part trois ! So, what is the difference in musical effect between the harmonic scale and the equal temper scale ? Whenever two notes are played together the ear “hears” the two notes both separately and together. The “togetherness” is a consequence of the perception by the ear of a third note, usually quite faint, the beat note with associated “beat frequency”. The effect is very noticeable when two recorders are played, as the notes are very “pure”. 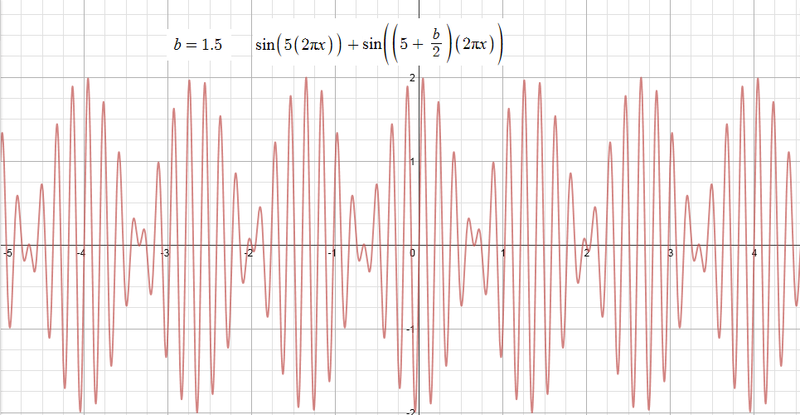 A pure note is one which consists of vibrations at exactly one frequency, and this is described by a sine wave or sine function y = sin(2πkx) where x is time and k is frequency. 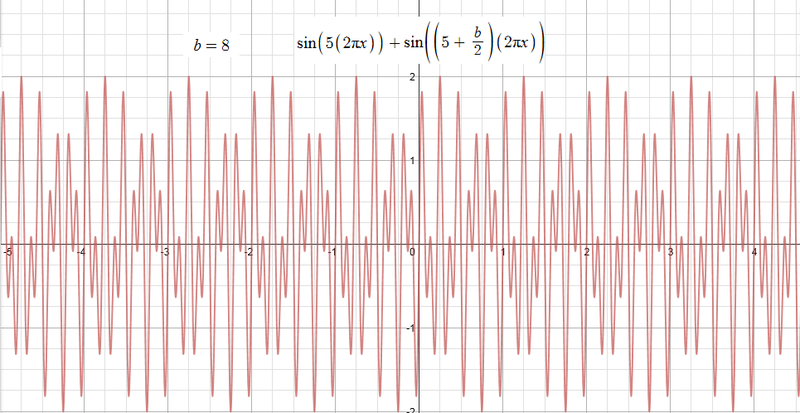 The second thing to note is that in the case of 5 and 5.75 the frequency ratio is 5.75/5 = 23/20, and this is greater than the relative frequency of the 9/8 whole tone (C to D), and a bit less than 6/5, one of the estimates for the interval C to Eflat. This one has quite a large effect on the perceived sound of the whole tone interval, and is one reason why it is difficult to hear the two notes separately. Now we can see what this all means in the harmonic tuning system. Let us take the notes C and E, frequency ratios 1 and 5/4. The difference is 5/4 – 1 = 1/4. What note, if any, is this? 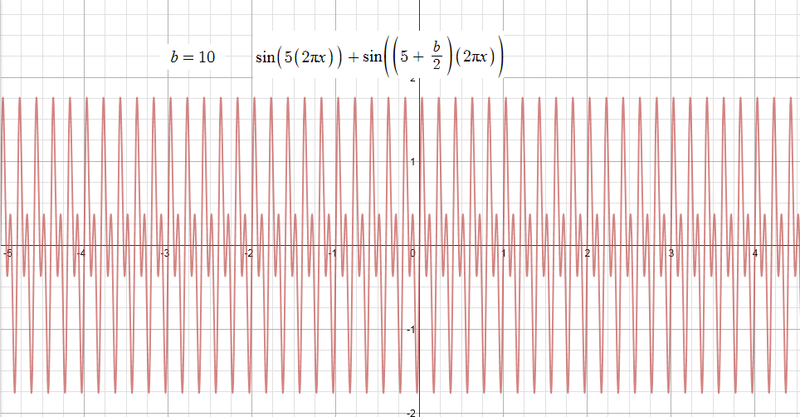 We have seen that multiplying by 2 doubles the frequency and produces a note one octave higher, so dividing by 2 produces a note one octave lower. Do it again and we get a note two octaves lower. 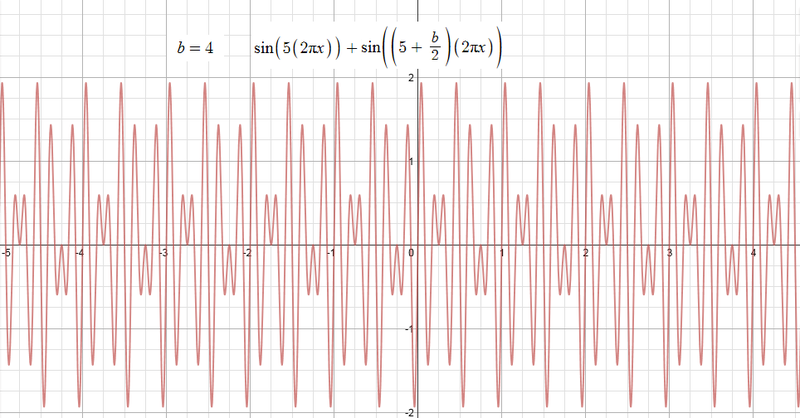 So the beat frequency for the pair CE is the C two octaves down. I will write this as C,, and the C two octaves up will be C”. This means that each (in this case) of the two notes C and E is a harmonic of the beat frequency. Consequently the CE interval will appear to have more “body” than might be expected. Just try playing the C on its own and then with a quieter 2 C’s below added. This can be done for all the intervals on the harmonic scale (results shown in the table below). The main conclusion I have come to is that the reason a choir trained without a piano accompaniment has a fuller sound than one used to singing with a piano, or other musical “backing” is that the first type automatically tunes itself in the harmonic system, and consequently has the benefit of beat frequencies which are in tune with the notes being sung. This is particularly noticeable with barbershop singing. 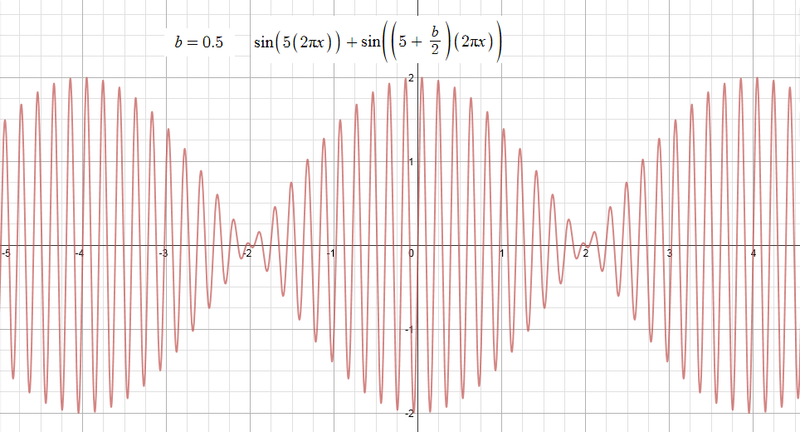 Harmonic: interval is 1 to 5/4, beat frequency is 1/4 or 0.25 , nice ! 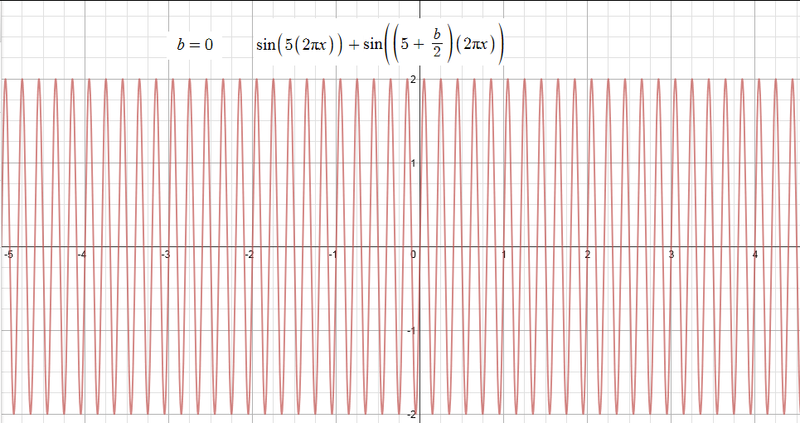 Equal temper: interval is 1 to cube root of 2 (twelfth root of 2 raised to power of 4, 4 semitones from C to E), and this is 0.260. So when we look at the second harmonic of this we get 4*0.260 = 1.04, which is NOT C. It is a bit less that a semitone above, and creates a low volume buzz that causes the major third to feel harsh. The fifth, C to G, is not as much affected as the two systems give almost the same frequency.